Let’s see – what can I check off my list for this trip? Oh, I do so love being in this city! When I’m here alone, I don’t generally have a set agenda (well let’s be honest – that’s how I often travel anyway), but I always seem to manage to fill my time here. While that may sound a bit odd to people who want to squeeze every bit of time out of the places they visit, it really isn’t odd for me. So much of the fun I have in London is just in being here as I get a great energy from this city. Whether I’m doing a bit of Blu-ray shopping at HMV, going to a museum, or just walking around (especially when the weather is nice, as it has been so far), I get a lot of enjoyment from London. I learned a long time ago to travel in the way and to the places that make me happiest, so take a page from my book. Travel is what you make of it! 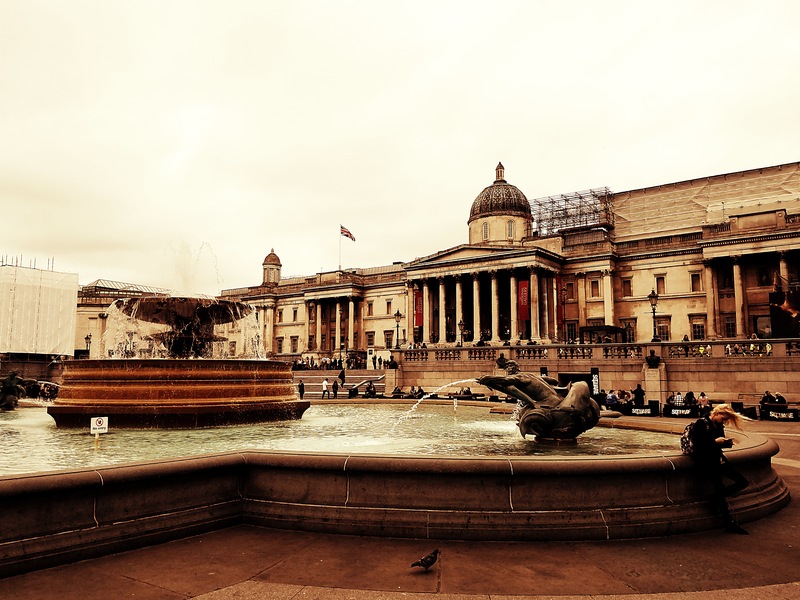 My second-favorite place to just “be” in London is Trafalgar Square and it’s where I start nearly all of my trips here, if I can help it. So naturally, that’s where I started this trip! 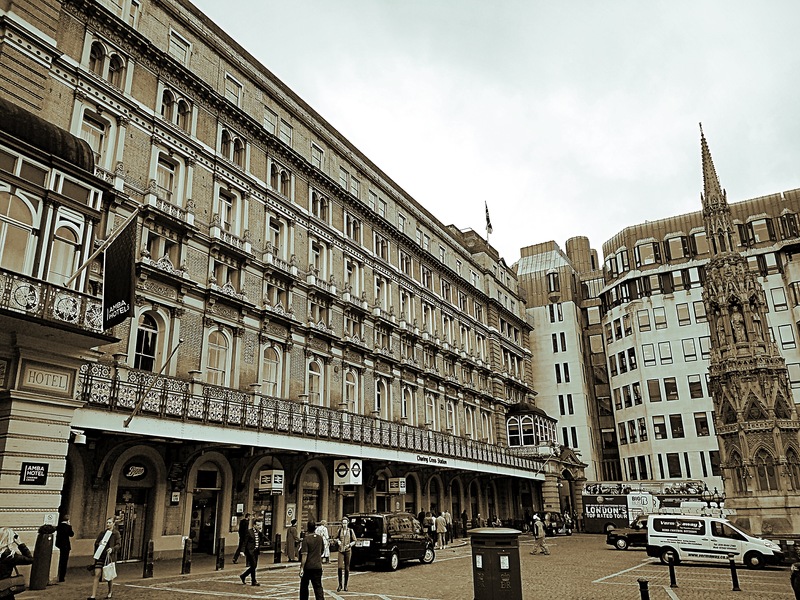 Because my hotel is so close to Earl’s Court, I was able to quickly walk there and catch the District line to Embankment, which is just a few minutes away from Trafalgar Square. Easy-peasy! I use my Oyster card to get around London and I highly recommend getting one if you’re visiting London for any length of time or if you visit frequently. They can be picked up easily from most stations or you can buy a Visitor Oyster card ahead of time – they work the same as regular Oyster cards and have the added convenience of being delivered to your home already pre-loaded with credit. Something new since my last trip here (Nov 2015) is the push to also use contactless payment for tube, trains, and buses, so that could be a great option as well, since it has the same daily caps as Oyster cards without needing to be topped up. I haven’t tried it myself, but I’ve seen people doing it and it seems just as easy as Oyster cards. 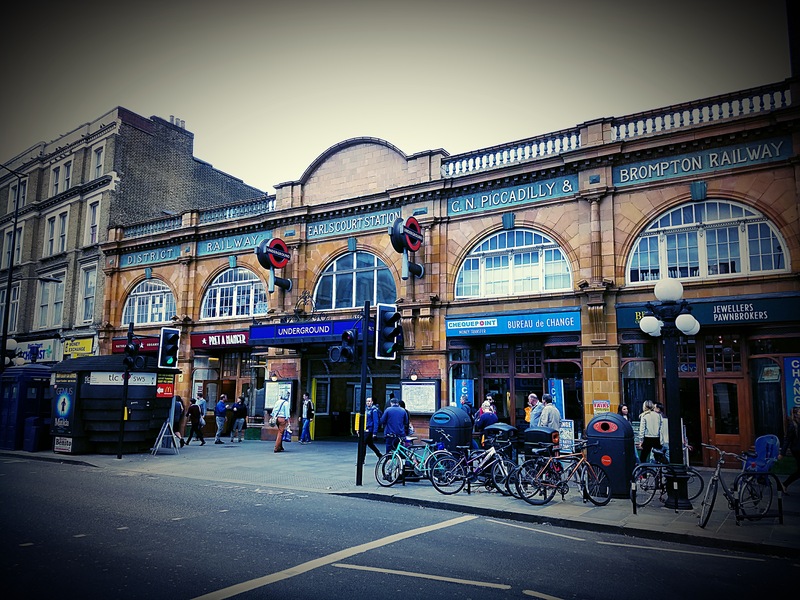 Of course, there are also travelcard options that can be good as well, so do a little research and figure out what works best for you based on how long you’re going to be here and how much you’ll be using public transport (spoiler alert – you’ll use it a lot while you’re in London!). After enjoying Trafalgar Square for a bit (and a quick Facetime with Scott back home), I went literally around the corner to my favorite lunch spot, Tortilla. I say lunch, but really I just love their food, so I’ll eat there anytime. 🙂 If you’ve read my previous London posts, you’ve already heard about this place, but it’s just so good that I have to come back every time I’m here. I love Chipotle at home and Tortilla is similar, but definitely has its own flavor. 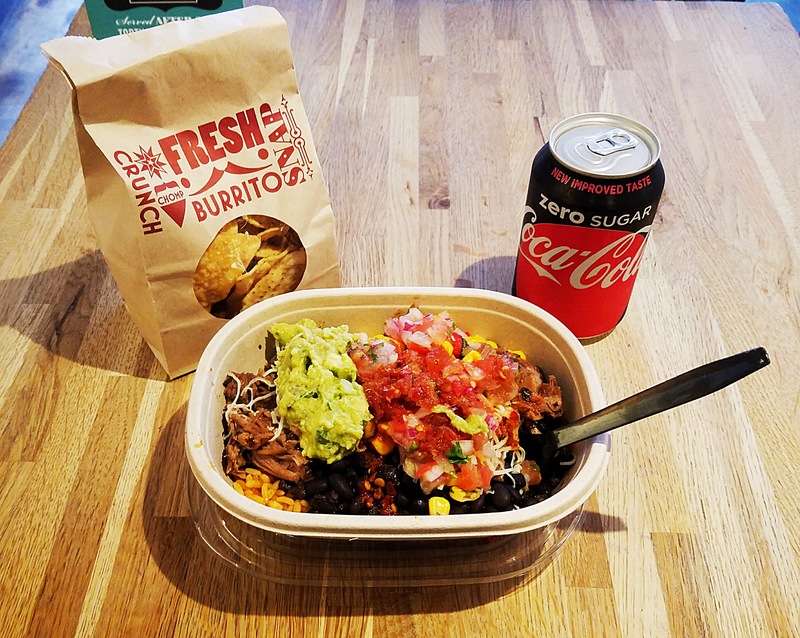 A large naked burrito (all the filling served in a bowl instead of in a tortilla), chips, and a can of soda cost me £10/$12 USD and that meal always lasts me allll day, so it’s totally worth it. Check it out the next time you’re in London! After my tasty lunch, I made a quick trip to Leicester Square, another favorite place to visit. This one has changed a lot over the years and it seems like there’s always something going on there (last year, I couldn’t even walk through it because it was full of people and stuff for some kind of funfair/carnival), including construction, but it’s always nice to stop by. Ruth Ann and I used to always stop at a gelato place there, but it closed a couple of years ago, which is a bit of a bummer. Still, that’s okay – lots of other places to get gelato, right? 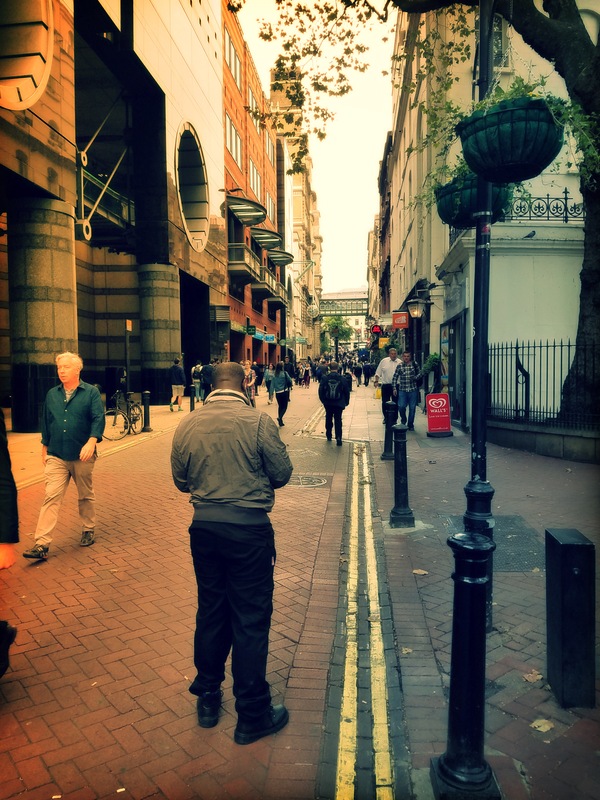 My Leicester Square drive-by was followed by a nice walk up to Camden to run an errand at Silva Screen Records. 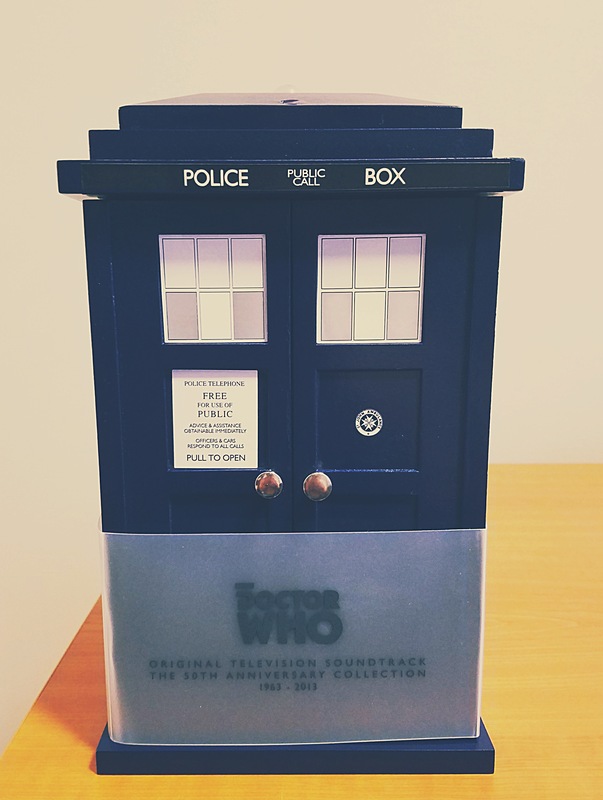 Last month, I won an eBay auction for an amazing Doctor Who 50th anniversary soundtrack set that sold out almost instantly when it was released a couple of years ago. Because they were going to charge me quite a bit for shipping, I asked if they would hold it until I came to London, which they were happy to do. I totally lucked out! It was a brand-new set, left over from the pre-orders two years ago and Silva only had them because a handful of people didn’t follow through on theirs, so their loss was my gain. For better or worse though, I quickly realized the high shipping price was legit because the set was way bigger than I anticipated. Not huge, but it’s a solidly-built TARDIS, so hauling it through London isn’t something I would have chosen to do, but it was worth it in the end. 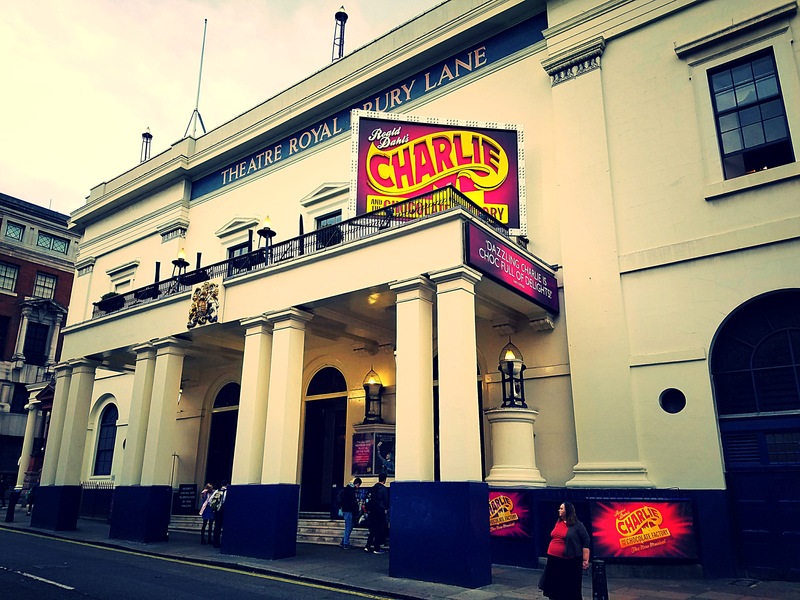 After I got the set back to my hotel, I did some photo editing and jumped in the shower for my final planned event of the day, a West End production of Charlie and the Chocolate Factory. My friend Zoe (formerly from the US, but she’s been living in the UK for several years) arranged free tickets through someone she knows who’s involved in the production, which was amazing. She and a group of friends go to shows somewhat regularly, so there were eight of us there. Given that, I assumed the seats would be in the upper balcony (not that I’d ever complain about that – free is free! ), but they were in the stalls (on the floor), just ten rows back from the stage. How cool! And it was such a great show, too – awesome cast and great technical work. Really glad I got to see it! And of course, I was happy to see my friend Zoe and meet everyone in her group. Definitely a great way to end my first full day here! Now, for pictures. Don’t worry though – there aren’t nearly as many as there have been in the last couple of posts! 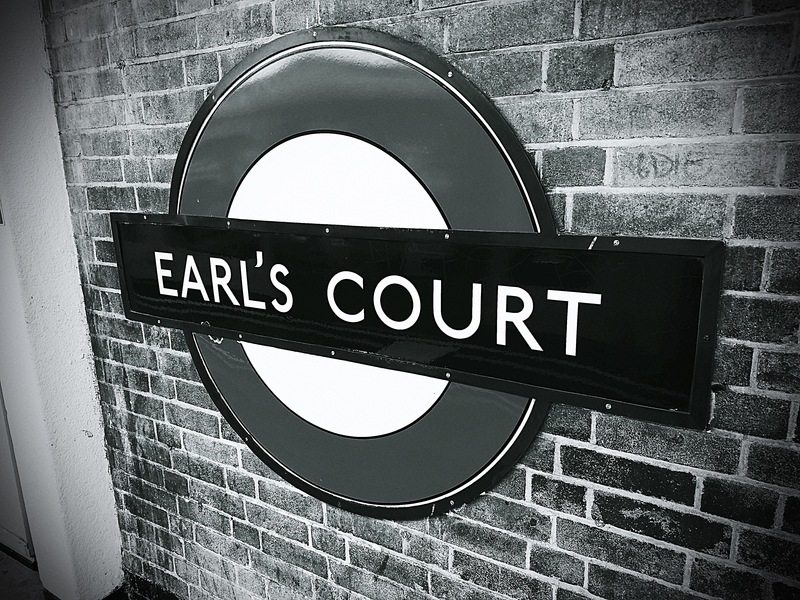 Earl’s Court Station, located just a few minutes from my hotel – so convenient! Also, can you spot the TARDIS? I still love Underground signs! I don’t love them quite as much when I accidentally take the wrong train, but that’s okay. 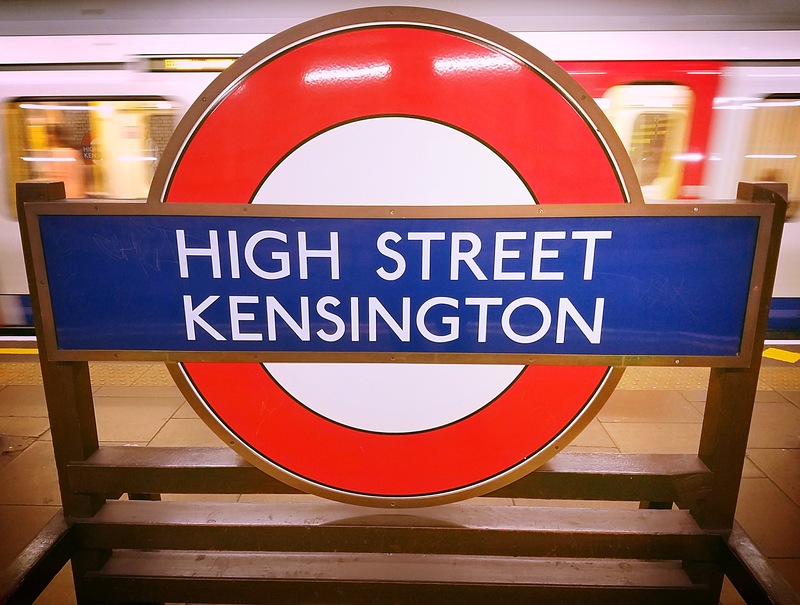 I just had to turn around at High Street Kensington! I was greeted by Villiers Street as I left Embankment (once I got on the right train). Charing Cross is my normal “home station” when I stay at my friend’s house. 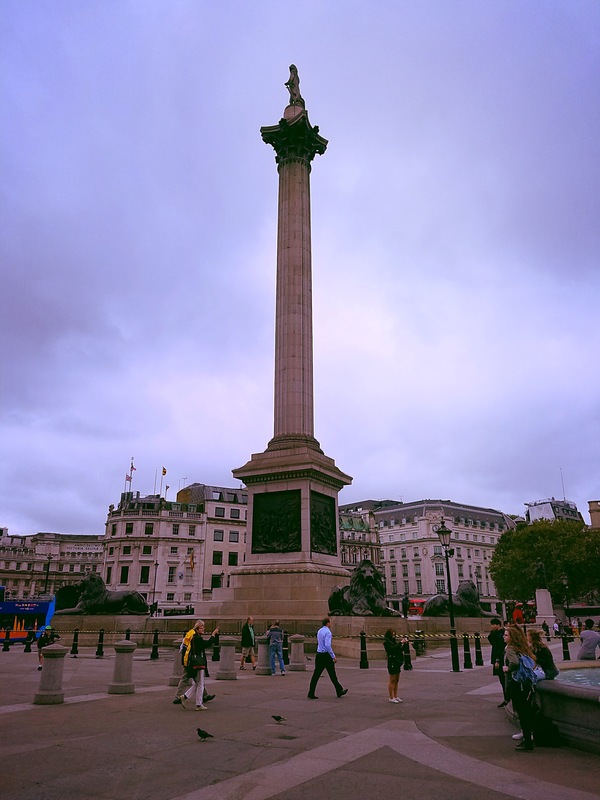 Lord Nelson sitting atop his column as usual. 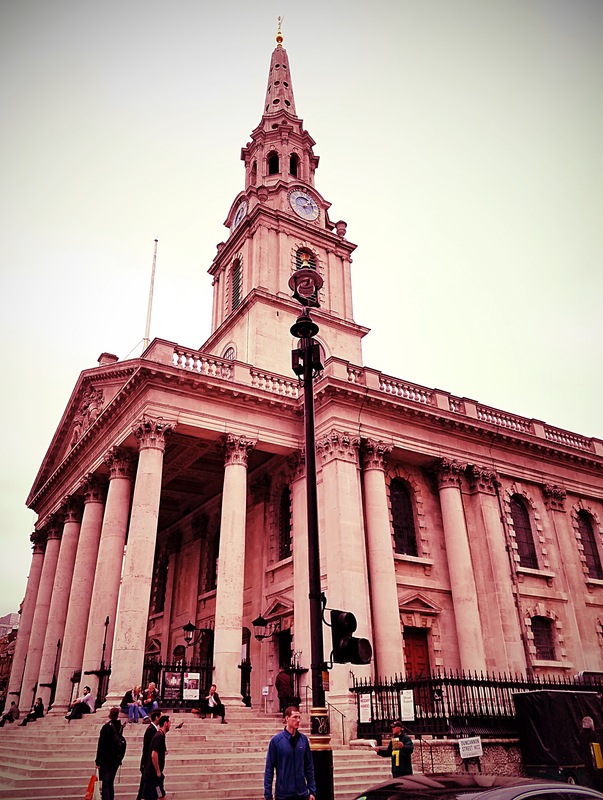 Every time I stop by St. Martin-in-the-Fields (just off Trafalgar Square), there’s something going on (including this day), so I’ve never had a chance to properly explore it. 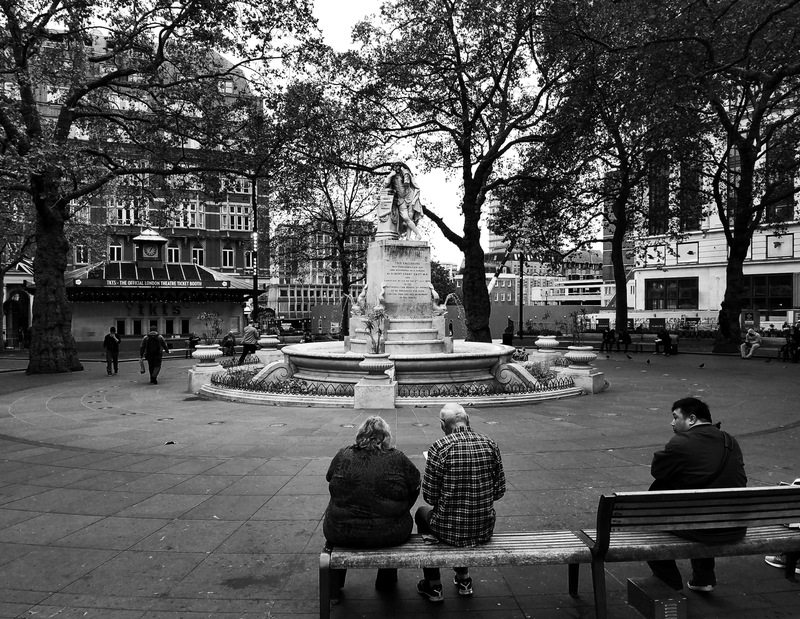 And another happy place – Leicester Square. 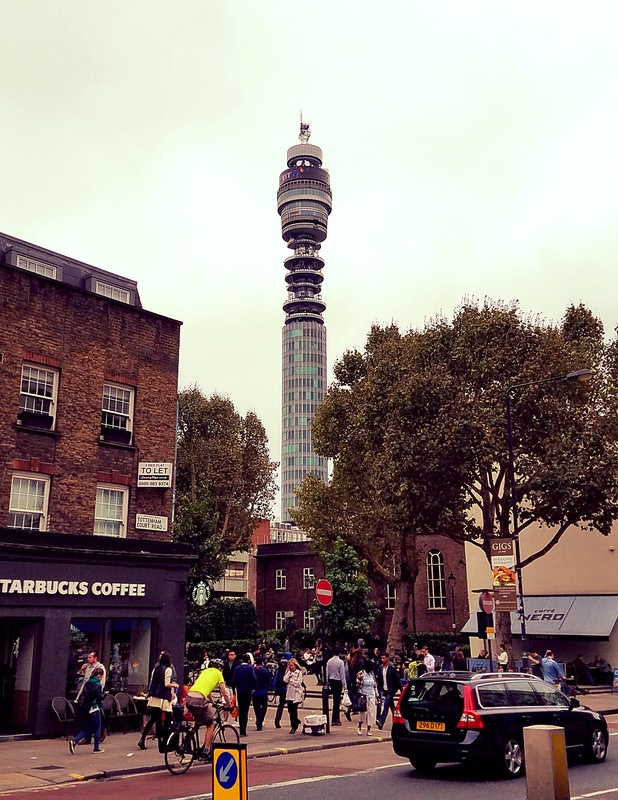 While walking to pick up my soundtrack set, I came the closest I’ve ever been to BT Tower. Did you know it was the tallest building in the UK from its completion in 1964 until 1980? 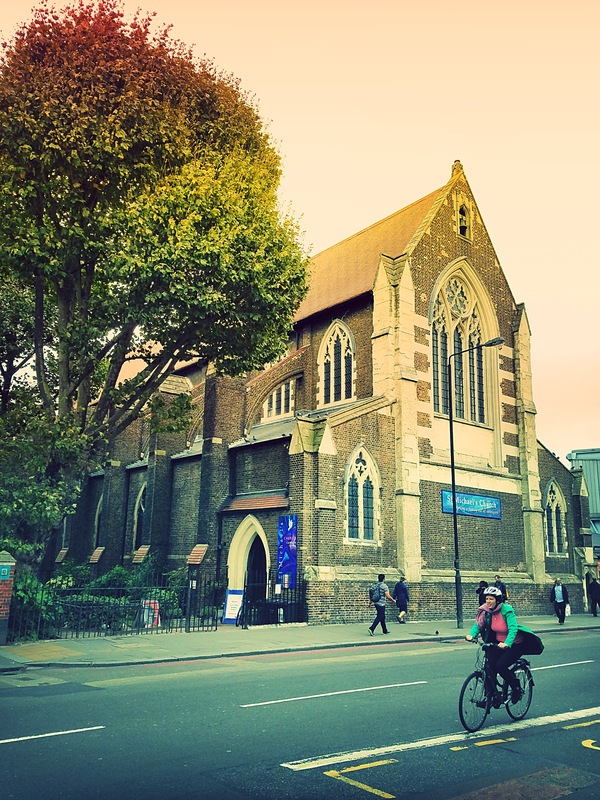 St. Michael’s Church in Camden. I didn’t go in, but the building caught my eye. It was worth lugging this thing through London! 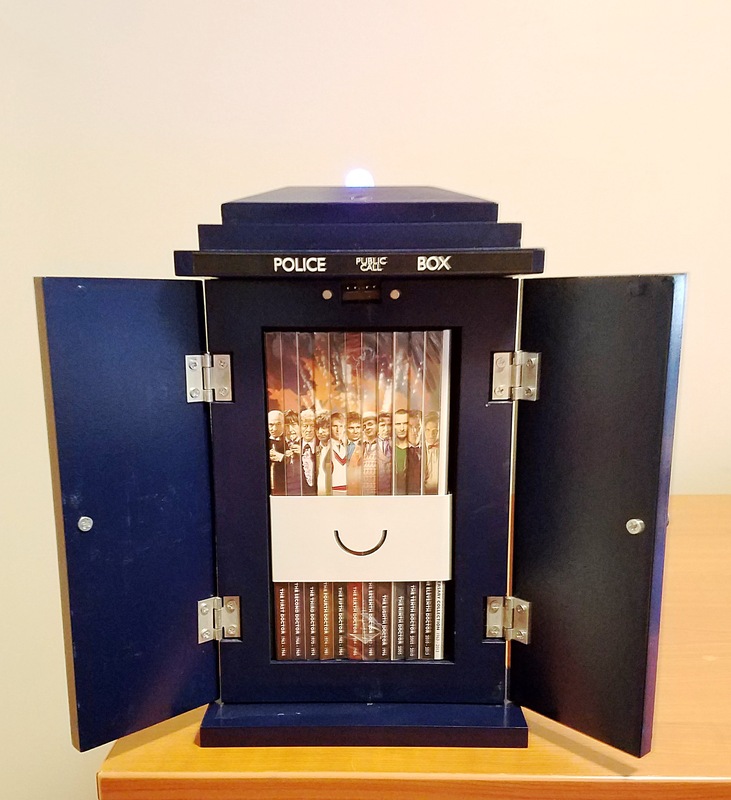 When you flip the switch on the back and open the doors, the box plays the TARDIS landing sound and the light on top flashes. Outside the theatre for Charlie.